Zsa Zsa, seen here being held by her owner, Megan Brainard, died some two weeks after winning the World's Ugliest Dog contest in California. 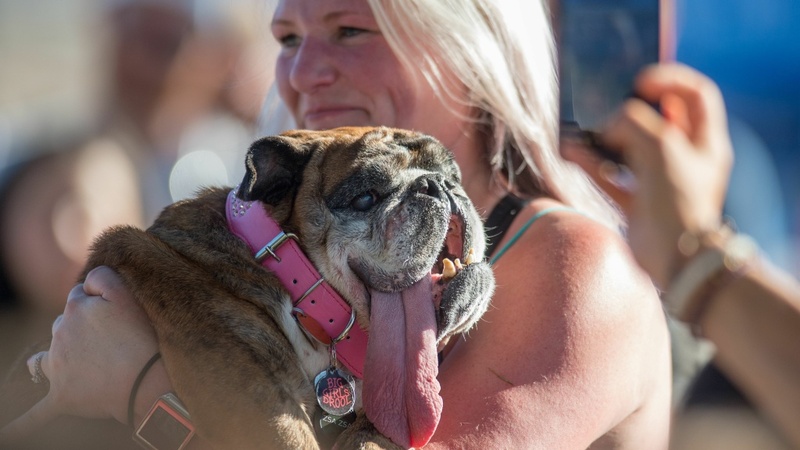 Just over two weeks after she was crowned the World's Ugliest Dog, Zsa Zsa, an English bulldog with a penchant for pink and a perpetually lolling tongue, has died. She was nine. Zsa Zsa went from enduring years living in a puppy mill to being adopted by a family and finally to winning fame and fans. Put up for auction after her breeding years were done, she was bought by an animal rescue group before making her way to Brainard's home. "Her mother saw her beautiful picture on pet finder and HAD TO HAVE HER!" the dog's entry to the contest said. "She now lives out her retired life in Anoka, MN." As is often the case, retirement brought new chances for travel. Zsa Zsa and her family made a long road trip to compete in the World's Ugliest Dog contest, which is held in Petaluma, Calif.
After her big win, Zsa Zsa's family said, "We are so excited for her, she deserves this." The dog then flew from San Francisco to New York, for an appearance on the Today show. In deference to her celebrity status, she sat in her own seat in the passenger cabin. Recent updates from Brainard have shown Zsa Zsa being doted on by children — who also took on the job of brushing the dog's jutting teeth. As we noted about the annual contest, its organizers say that it's meant to show how lovable and unique all dogs are, regardless of what some people might view as imperfections. Zsa Zsa's winnings include a trophy and $1,500 — a cash amount that was also given to Underdog Rescue, the group that rescued her.